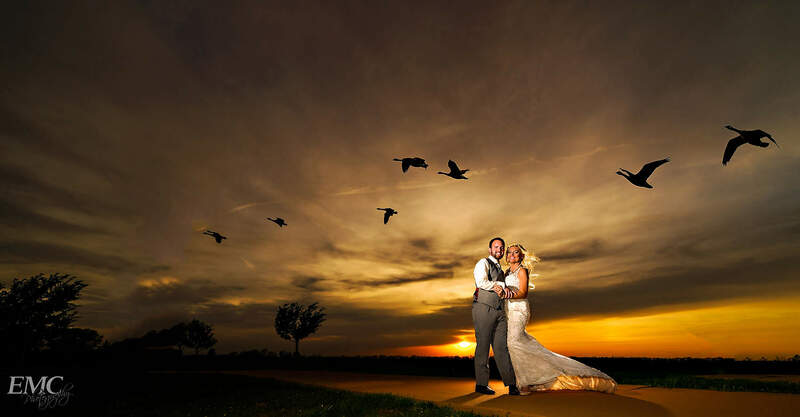 We recently blogged a photo of Liz and Cole’s wedding with geese flying above them. And we had a few people ask about the lead photo at sunset of them with the birds at Erin’s Pavilion (here). Not the technical details behind it, but the why of it and what we actually call it. We call them our Signature shots. Some photographers call it their epic shot. And some don’t try for this at all. 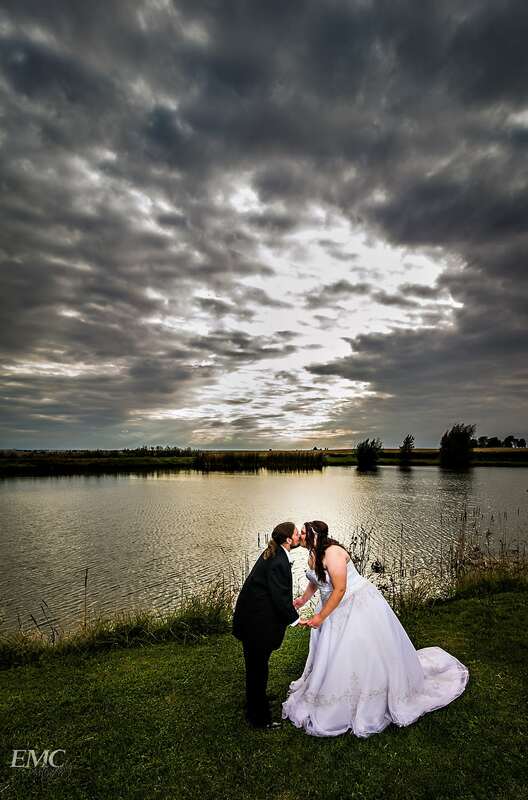 For us, this image is always something different, special, and unique to the couple and their wedding day. I consider it a special challenge for me to create something unique to each event. Geese took off in flight as we were capturing a perfect moment with Liz and Cole at Erin’s Pavilion in Springfield, Illinois. I’ll let you in on a secret – it’s always a surprise for not only the couple, but for me as well on what is created. I don’t decide on a signature shot until the day of the event; and sometimes only moments before creating it. I definitely have a vision as to how I want it to come out when shooting, but usually not until that point. I like pushing myself all the time. The way I look at it is simply. First, what is the weather is doing? We generally shoot in Illinois so weather can and is pretty much unpredictable. There is no perfect time of the year for weddings in Illinois if someone wants perfect weather. Second, location. What is the venue like? I thrive on challenging places to shoot. Maybe my days as a photojournalist where I consider the world to be my studio come to the forefront. 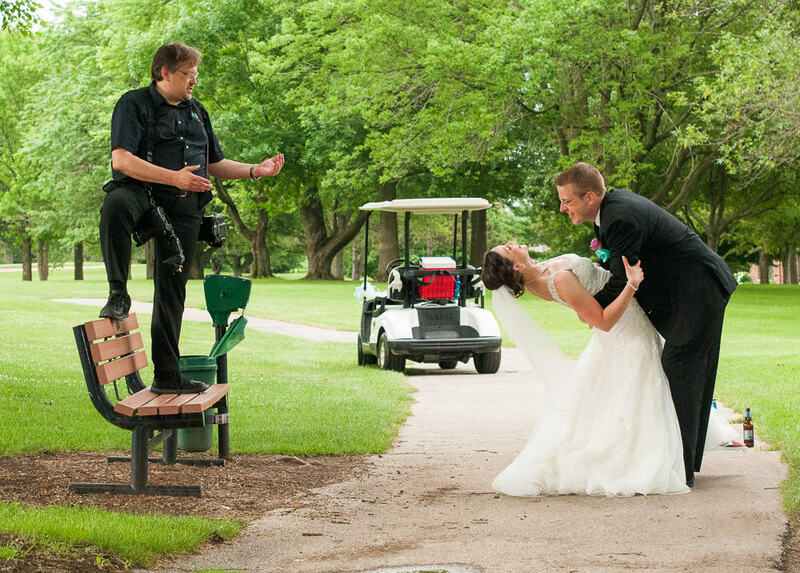 I recall shooting a wedding several years ago near Peoria in July. Gale force winds, temperature in the 50s and a frozen wedding outdoors. 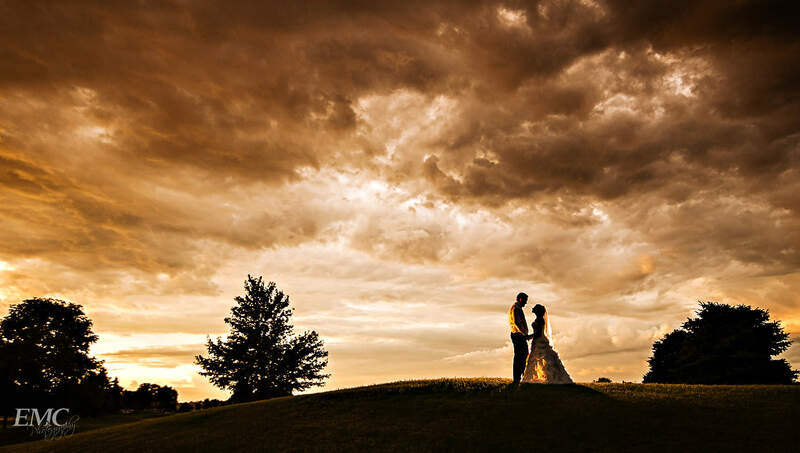 But even with all that we were able to get an amazing image of the couple with the golf course behind them at sunset. 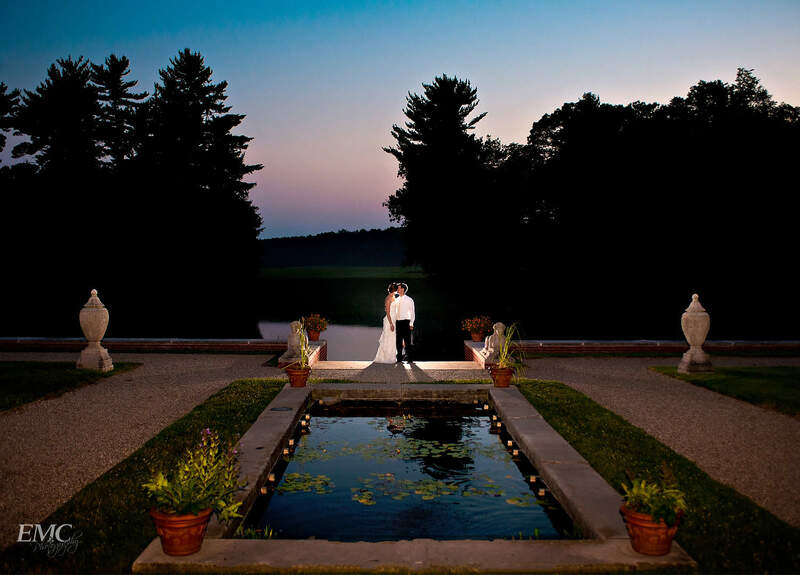 Terry and Laura took a break from their reception at Robert Allerton Park’s mansion for a sunset photo near the koi pond near Monticello, Illinois. Another wedding, again in July, with temperatures never leaving the 90s for the entire day at Robert Allerton park. Changing out our clothes during the day because we were soaked through and through. Humidity so high that it seemed like it was raining as the sun started to dip below the horizon. For those of you that have been in our studio space, this is the large image on the wall with the koi pond in the foreground. November? Wedding day brought blue skies and temperatures in the upper 80s. And then there are days of rain or snow…. So with that in mind, weather is not something we depend on. We might, in fact, curse it. And check out forecasts many times as the wedding date approaches. Our signature images are meant to be big. I mean BIG! It’s created for a canvas print, something for above the couch or in your entryway not a 5 x 7 in a frame on the desk. Plus, it’s not always the couple as the forefront in the photo, rather they are an artistic part of the entirety. And to do this I’ll bring my full arsenal of photography skills to bear on creating it. Off camera flash, yep. Colored gels? Maybe. Long exposures? A possibility. Lying down in the mud? (Me, not the couple) Sure, why not. Lying down in the snow? Okay, frostbite might be factor but I try to work around it. Super-wide angle? Maybe. Will my assistant be at risk with life and limb? It has happened. Ed directs Ashley and Rick in posing for a photo at the Jacksonville Country Club. Now — having said all this, I do have to add a few details to this. Our signature shots tend to happen with our longer packages, we need the time to shoot them. I don’t mean it takes a long time — some of our signature shots are shot in five minutes or less. But usually about 20 minutes is needed. And even trying as hard as I can, we don’t get a sunset shot at 4 p.m. when sunset does not happen until 8 p.m. I’m good, but unlike one of my hero’s, Doctor Who, I don’t have a TARDIS and can’t zoom around in time. 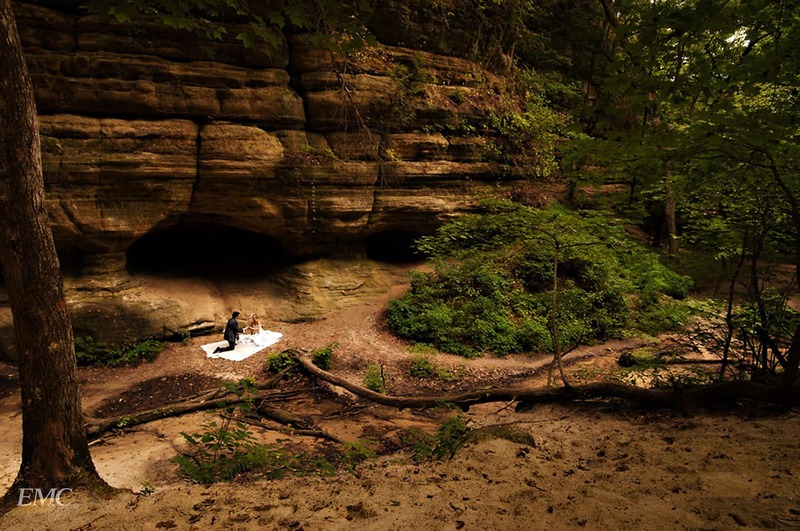 A couple of ours took advantage of the dry weather to hike down St. Louis Canyon near Starved Rock Lodge with us to capture some unusual picnic images. 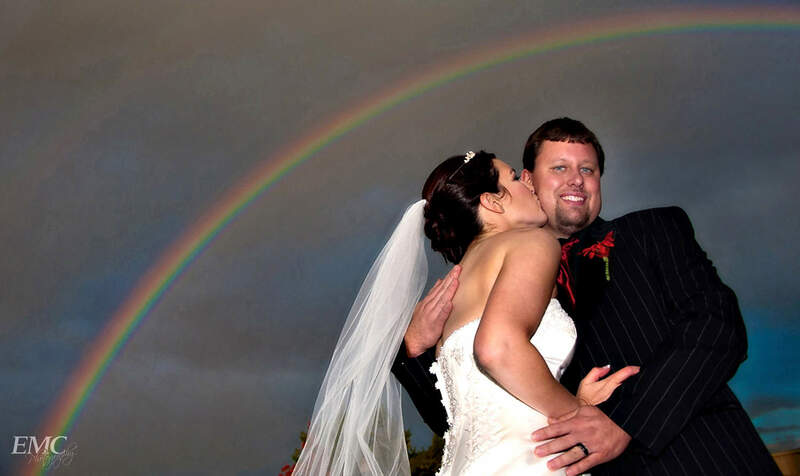 A rainbow appeared for just moments as Sarah and Phil prepared to head for their reception near downtown Champaign. Even though it looks like a wedding day, this was more along the lines of a Day After shot– except it was nearly ten years after. The couple worked with us to create some anniversary photos that highlighted was missed on their wedding day. Love this Signature Shot! Michael and Kala’s Wedding day photos in a Champaign, Illinois wedding. We only had moments to create and capture this photo before the skies opened up and rain starting pouring again — as it had done the entire time of the reception. This photo was shot at Stone Creek Golf Club. 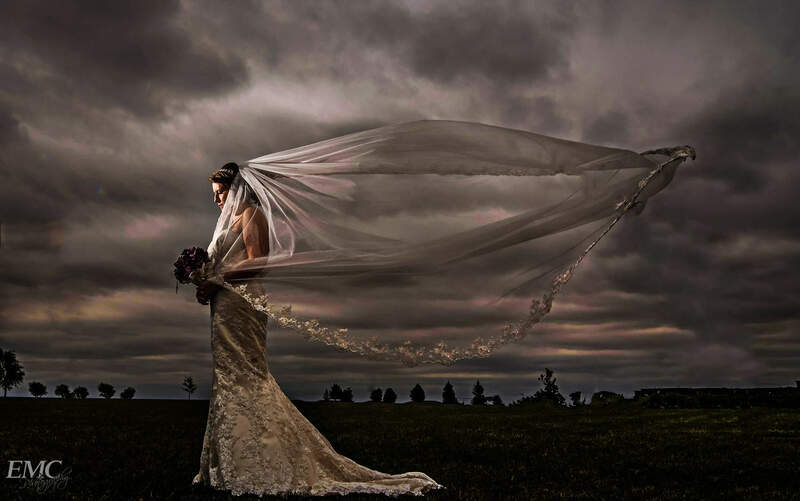 Kim posed for a perfect and unique image of herself on her wedding day in what was bad weather in Bloomington Normal, Illinois. 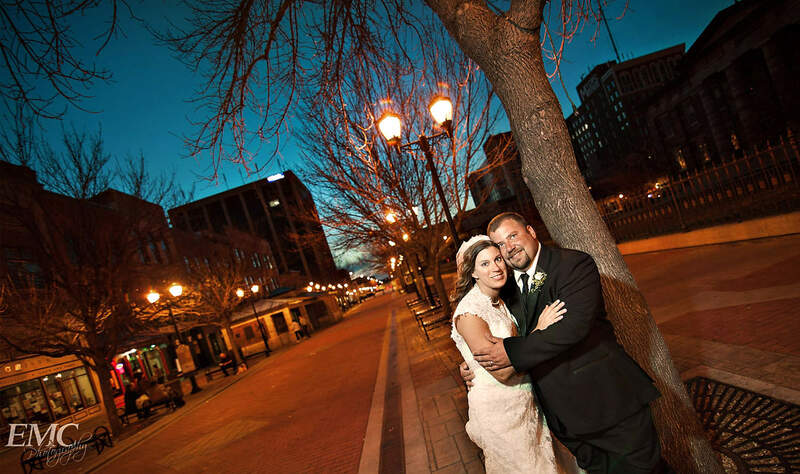 Joe and Chris posed in downtown Springfield, Illinois, during their wedding day photography for our signature image from this wedding. 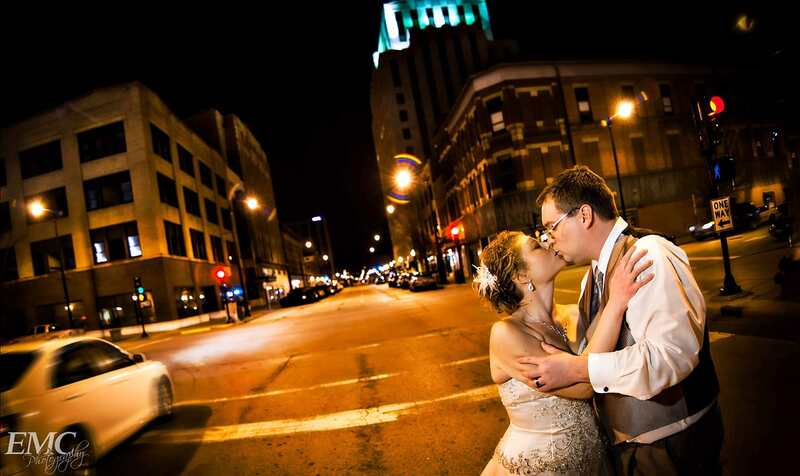 Jason and Sarah find downtown Springfield near the Abraham Lincoln hotel the perfect place for a kiss during their wedding reception, creating for them a fantastic memory and a special signature image from us. Beth and Josh knew they wanted something special on their wedding day — and picked a winery near Pekin and Peoria, Illinois for their day! We created this image near the lake at Mackinaw Winery. 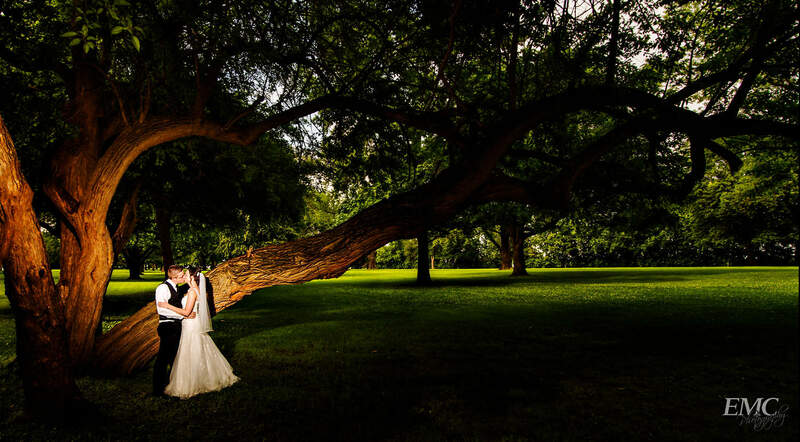 Rick and Ashley found themselves in a small, secluded spot at a Jacksonville, Illinois, golf course for their signature wedding day image. 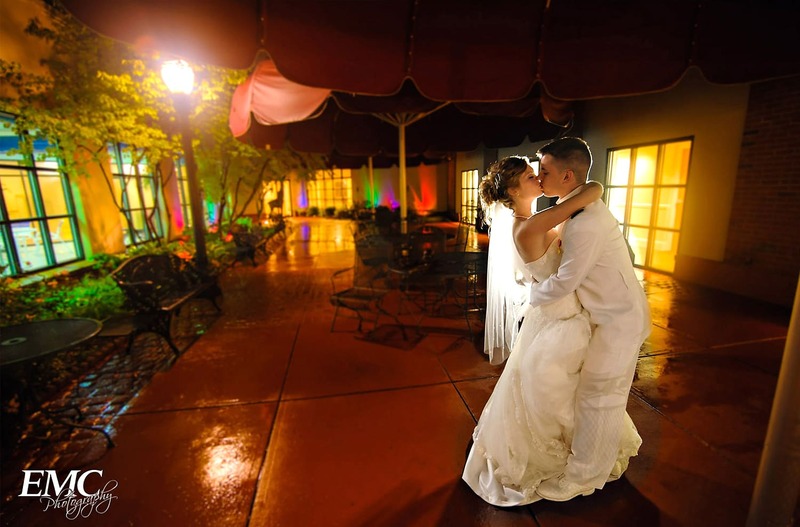 Andi and Eric share a kiss in front of the Normal Movie Theater during their wedding reception at the Bloomington-Normal Marriott Hotel & Conference Center for their signature shot.